Car Parks – how many, and how do they influence the city center? The Berliner Straβe – this notorious throughway is cutting right through the heart of town. How does that influence the city center? Let’s have a look at the car parks. Frankfurt seems to have quite a lot of them (see map below). In the planning literature, it has been widely discussed that having more parking lots will eventually attract more cars. This, in itself, is not a bad thing. 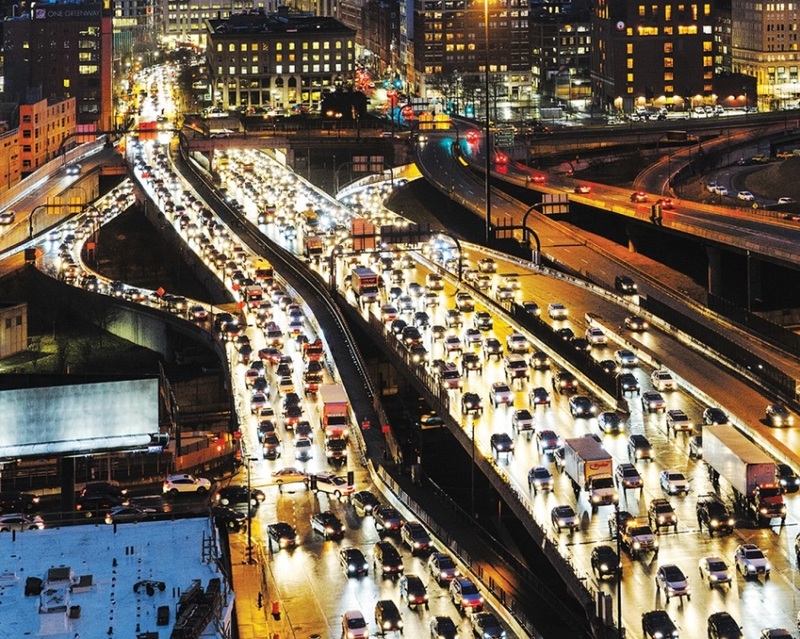 Only if one takes into account that cars are strongly connected to air pollution, traffic fatalities, congestion, and the occupation of space, this idea becomes less attractive; if not irrational. Especially concerning the fact Frankfurt is said to be full, and housing prices skyrocketed in the last years, space becomes more and more valuable. Simultaneously reserving space for parked cars seems to be at the least counterproductive. The sometimes happily used argument that people otherwise do not shop when they are not driving their cars is proven to be false, as research has quite convincingly showed that it’s not the car driver, but the ones on bikes and using public transport that spend the most in the long run. But then again, is it really true parked cars are taking up so much space? To investigate that, a simple calculation will do. By counting all the parking lots together and multiplying that number by the surface of one parking space, one gets a measure of the whole occupied space reserved for inner-city parking. Okay, here we go. If we count correctly, there are around 13,300 public parking spots in – and just around – the city center. (Note: private parking spots are not included here.) Most of them are located in so called indoor parking lots, whereas a few are on the side of the streets. A general parking spot, by law, is around 11.5m2. So, in the end that means 13,300*11.5 which amounts for around 152,950m2. 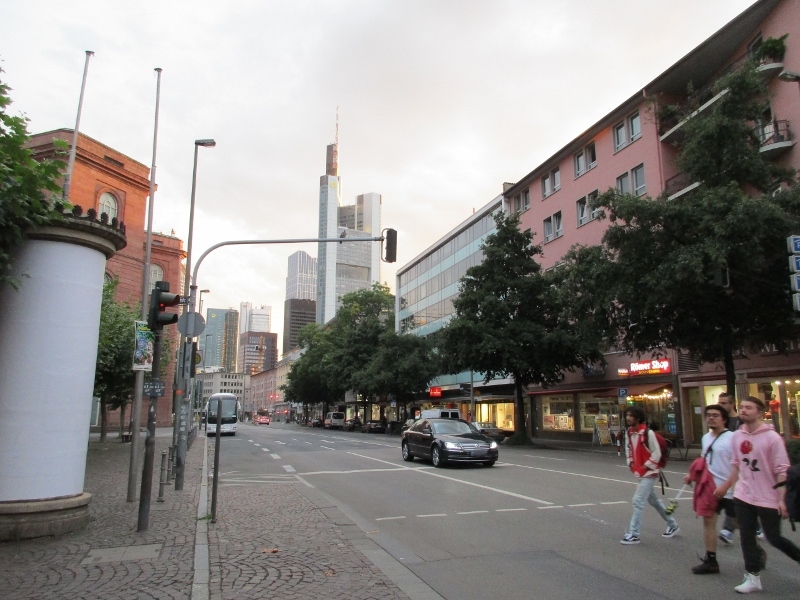 This means 152,950m2 is reserved for parked cars in the city center of Frankfurt. Is that a lot? Or is it negligible? To visualize how large (or small) that space is, one can have a glance at the map below. When all cars would be parked side-by-side, this would be the result (the blue area). 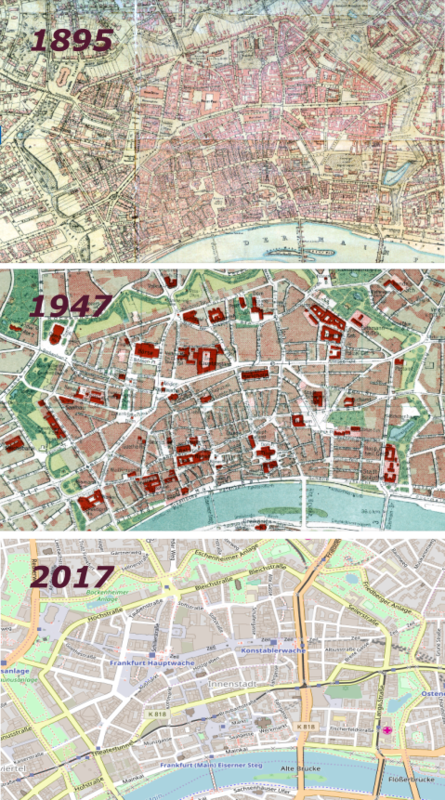 From Goetheplatz to far up the Zeil, Kleinmarkthalle and the Berliner Straβe there would be non-used cars: Basically holding up space otherwise useable for work, living and leisure. 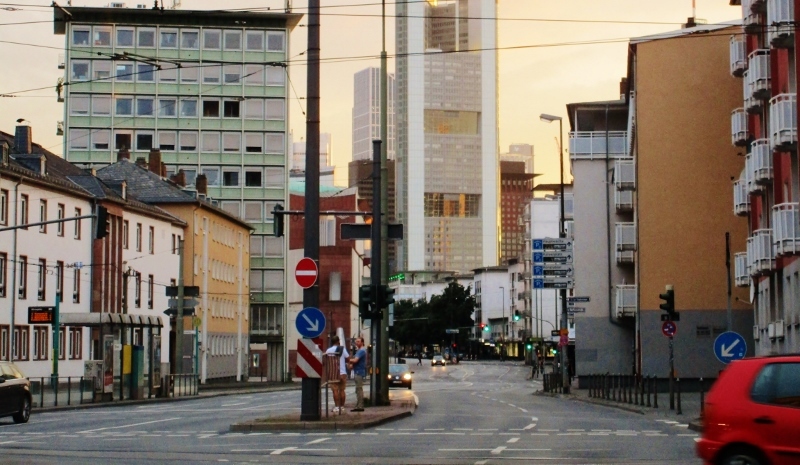 In a fast growing and ambitious city such as Frankfurt this can be seen as problematic. Apart from cars standing still in 94% of the time, they consequently also move in 6% of the time. One of the roads that is arguably most well-known in accommodating for that movement is the Berliner Straβe. 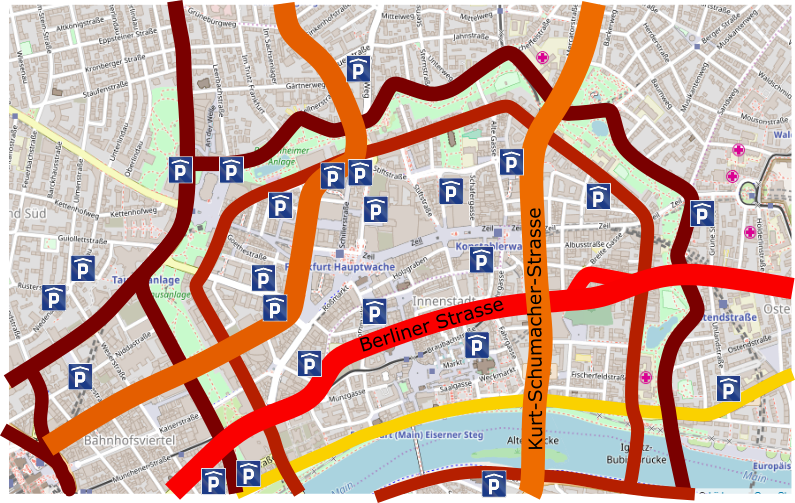 This 4-laned East-West corridor (see red line in map above) cuts right through the city center, separating the hugely popular Zeil-area, Kornmarkt and Kleinmarkthalle from the equally popular Römerplatz, Mainkai and Kaiserdom. To get from the Zeil to the Römerplatz one therefore has to cross the Berliner Straβe (using the intersection with the Neue Kräme). And here, something peculiar happens. As this is undoubtedly one of the most intensively-used pedestrian crossings in town, one would presume all its conditions perfectly serve the pedestrians interests. 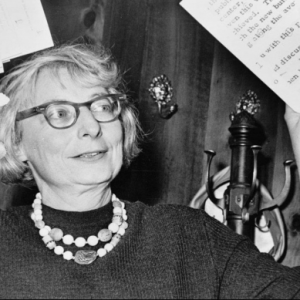 By having a look at the single-most important determinant, the traffic lights, nothing could be further from the truth. In order to cross this road in a normal pace one has – I repeat – one has to jaywalk (have a look here for the exact rules in Germany). How come, one might ask? Well, the situation here is as follows. It is, as said an intersection with traffic lights. One for cars and one shared for bikes/pedestrians. For cars, to physically cross the intersection, it takes up to 4 seconds (meaning a car starts from a point of standing still). For pedestrians, it takes around 12 seconds to 20 seconds, depending on the individuals fitness. And now the trick comes. The green and yellow light for cars amounts for 20 seconds. Enough time to cross even when one wasn’t at the intersection from the start. The green and yellow light for pedestrians and cyclists however, is only on for 10 seconds. Generally speaking, this means that the vast majority of pedestrians don’t make it to the other side of the road before the light turns red. Again, considering it is arguably the most important pedestrian crossing in Frankfurt; this situation seems at the least questionable. 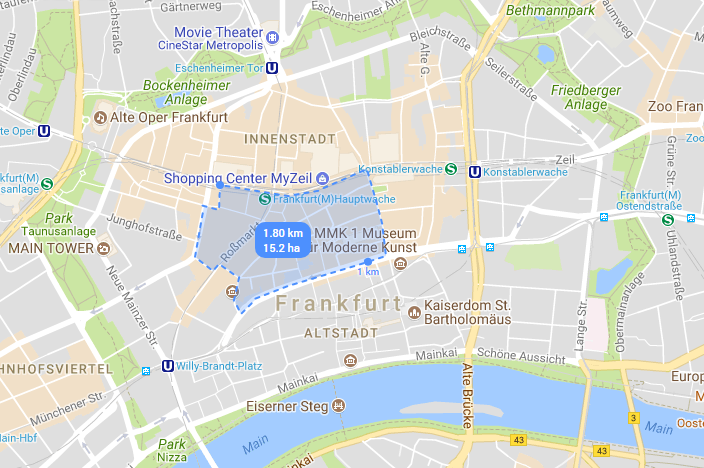 It seems fair to say, that considering the parking lots and the way pedestrians are treated vs cars, Frankfurt is a long way from the car free city Götz imagines. It seems fair to say that a good start would be to reduce the amount of parking lots and to change the traffic lights in favor of the ones that after all make the city that special place it normally is: pedestrians. Interested in Frankfurt? Here you will find out more about our Frankfurt adventures concerning ‘changing the streetscape’ and ‘suicide cycling’. 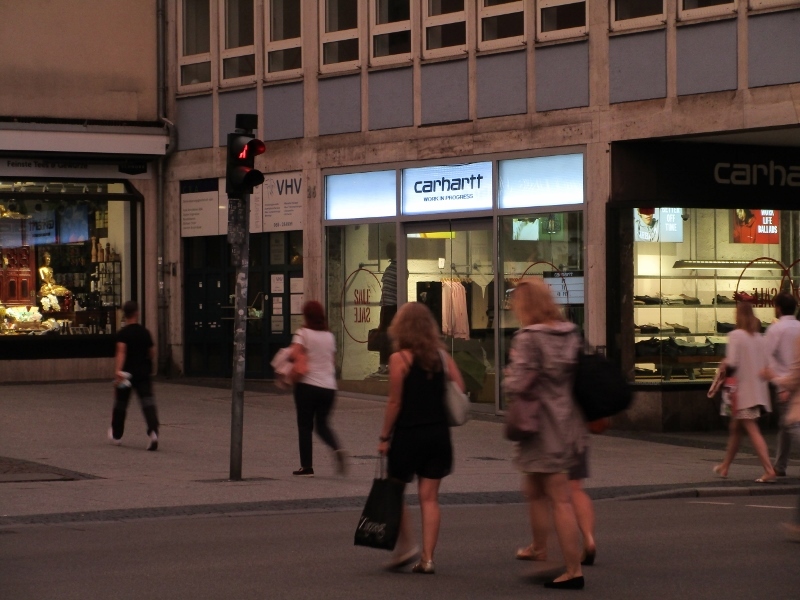 According to the German highway code, a green signal (for pedestrian and vehicular traffic alike) only indicates that road users are allowed to enter the intersection/crossing, so finishing to cross while the lights are already red is perfectly legal and fine. The setup of the Berliner Straße crossing therefore seems exactly right based on the timings you describe: If it takes pedestrians around 10 seconds to cross and vehicular traffic is stopped for 20 seconds, there needs to be a 10-second time for pedestrians who have entered the crossing at the last moment to make it to the other side of the street (this is called the „Räumzeit“, clearance time). If the pedestrian light was green for any time longer than that, vehicle operators would see a green light while there is a good chance that pedestrians would still be crossing. Many thanks for your swift comment! Also many thanks for the particular knowledge on local standards in traffic planning. 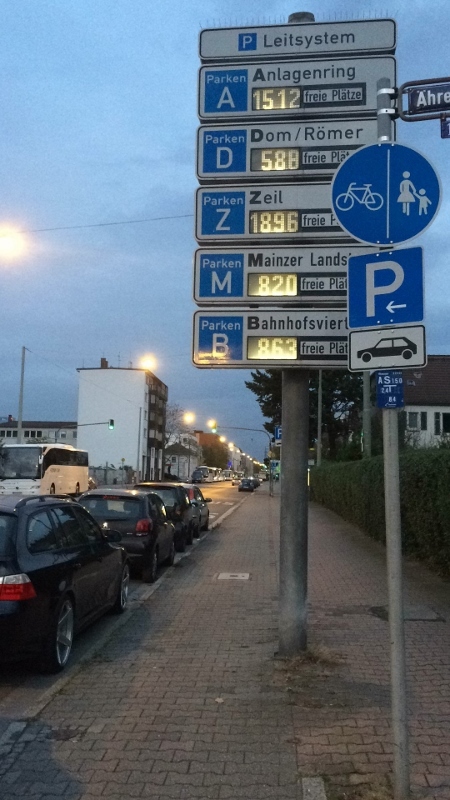 The way traffic planning is managed “gründlich” in German cities, there is no doubt, even though the traffic lights are on green majestically short, pedestrians are still aloud to walk through, as you referred to, the “Räumzeit” or “Zwischenzeit”. 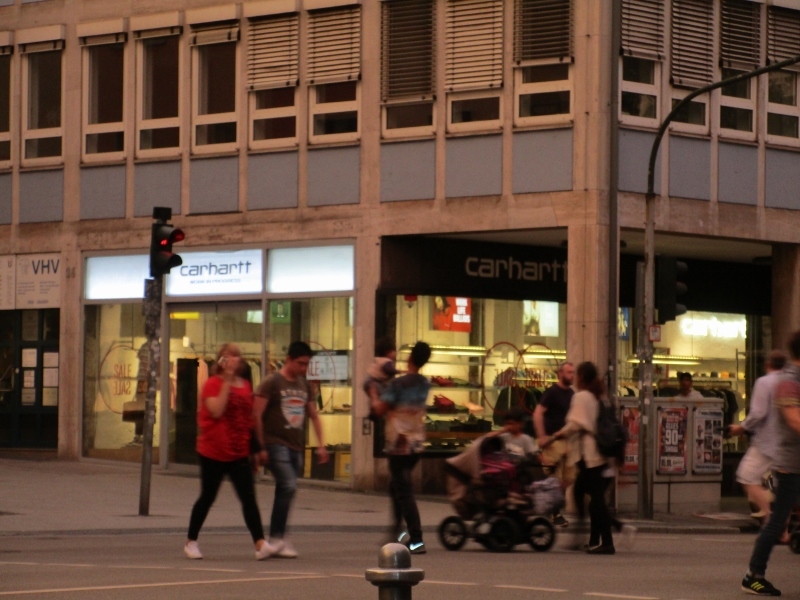 Whether or not it is legal in the German context, and whether or not pedestrians are used to the traffic lights turning red, is a rather technical perspective. In the argument above, I try to go beyond the technicality of things and look for ways to make the city more pedestrian-friendly. Then, it is important to look at the daily practice. As you might be well aware, on this particular crossing, it seems fair to say, that many pedestrians do have to wait and still do rush. Moreover, the time with the “Weihnachtsmarkt” perfectly shows how Frankfurt could make it more pedestrians friendly in the most clear-cut way: at that particular period in time, the green traffic light for pedestrians is on for a substantially longer time, making this crossing not only more gentle to walk on, but also showing, as a city, in a symbolic manner, which traffic flows you prioritise. I am sure the “Innenstadtkonzept” will, in the future, change this environment quite a bit in terms of traffic calming and a more gentle street design, but until that time, this cost-effective measure, already in place in December, could be pushed forward immediately.